The second of four volumes collecting the complete weekly "Video Views" columns (1999-2001) by renowned cartoonist, author and film scholar Stephen R. Bissette covers the video and DVD releases of January to November 2000 and opens with his scathing dissection of George Lucas's Star Wars: Episode 1: The Phantom Menace ("...the young man's dreams implicit and explicit in Star Wars swept up a generation; the rich man's fantasies of The Phantom Menace are lumbering, sterile, and mercantile in nature, as mechanical as the Droid army at the center of its most spectacular set pieces..."). It closes with his selection of the best & worst horror films of 2000, along with his daughter Maia Rose and son Daniel's all-time top-12 recommended Halloween titles for kids. In the course of that year -- and what a year it was! -- Bissette covered the Millennial films: American Beauty, Fight Club, The Insider, Three Kings, Boys Don't Cry, Being John Malkovich, Magnolia, Dogma, The Straight Story and more. Embracing popular favorites like The Cider House Rules and Erin Brockovich, Bissette eloquently championed critically reviled films like Snow Falling on Cedars ("...in a culture obsessed with delineating love almost exclusively in sexualized or familial terms, it is unusual to find such an honest and uncluttered expression of the most fragile of virtues we hold dear..."), Pitch Black, Luc Besson's The Messenger, Ang Lee's Riding with the Devil and Martin Scorsese's Bringing Out the Dead. He also shamelessly celebrated those films that were grand fun, from Galaxy Quest and Sleepy Hollow to Jackie Chan's Project A and others. As a seasoned storytelling and cartoonist, Bissette brought special insight to his praise for animated features like Hayao Miyazaki's Princess Mononoke and Bill Plympton's I Married a Strange Person, analysis of botched genre efforts like Supernova, and condemnation of dross like Scream 3, 28 Days, The Skulls and Bicentennial Man. Here are 2000's underrated sleepers: The War Zone, My Dog Skip, Ghost Dog, La Cucaracha, The Third Miracle, End of the Affair, Tumbleweeds, Boiler Room, The Minus Man, The Adventures of Sebastian Cole, Love & Basketball, and more. Here's the overlooked foreign films -- The Dinner Game, Todo Sobre Mi Madre (All About My Mother), Fritz Lang's The 1000 Eyes of Dr. Mabuse, etc. Bissette sheds light on the key documentaries (American Movie, Beyond the Mat, Divine Trash, Mr. Death) and already-forgotten curios like The Cradle Will Rock, The Lathe of Heaven and Fire on the Amazon. Here are Bissette's in-depth overviews of Mary Harron's American Psycho and Julie Taymor's Titus -- and why cutting-edge female filmmakers are drawn to such mayhem -- the trio of Ripley films based on Patricia Highsmith's novels, and the definitive Andy Kaufman video catalogue. 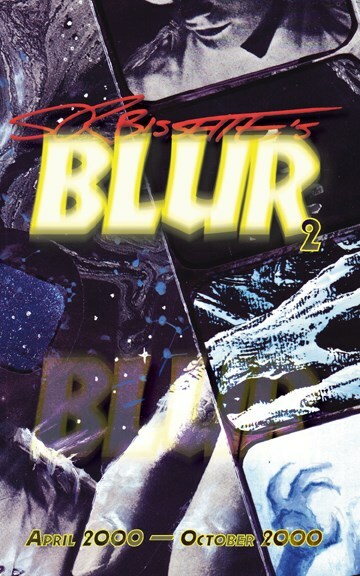 Savor the 'blur' of Bissette's comprehensive weekly columns from April to October 2000. He brings unflinching focus to it all, sharpening your own perceptions.